The following is a guest blog post from Marilyn McLaughlin. Marilyn is a 5th Grade Cambridge Teacher at Calusa Park Elementary in Naples, Florida. After her city was hit by Hurricane Irma, her school hosted a back-to-school celebration in conjunction with Governor Rick Scott's "Dad’s Take Your Child to School Day." You may have seen Marilyn's viral "Flipgrid Pods" tweet at the event. In this post she shares the special day and how she used Flipgrid to build community. Ah, summer…time to relax and think of new and exciting ways to motivate my students. My class had ended the school year with their #FlipgridFever on fire. When I asked them to reflect on what they liked about Flipgrid, they said everything except that they were embarrassed to film themselves in front of their peers. I knew I needed a solution that wouldn’t break the teacher summer budget and would allow the students to use their voice. On Twitter, I watched as some of my favorite Tweetchers created Flipgrid recording studios for their classrooms and knew it was the solution to my dilemma. I searched and came across the GigaTent Pop-Up Pod. Really used for camping, but standing tall at adult size, I knew it would be perfect. Not to mention, it came in FLIPGRID green! I ordered mine before the school year started. Flipgrid sent me some sticker swag and we were ready to go (get your's here: Flipgrid Pod). Flipgrid was introduced to administrators over the summer and quickly our whole district had #FlipgridFever. My administration came to me and asked about my Flipgrid Pod. 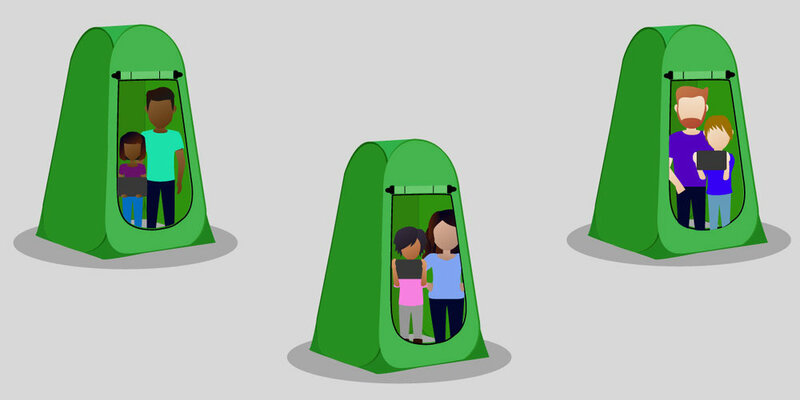 As a school, we ordered more Pop-Up Pods for our teachers to check out and use as needed. But before we could even share the pods with the teacher---we were hit by Hurricane Irma. With Naples taking a direct hit, our community was devastated. Downed power lines, no electricity, damaged roads and homes. School cancelled for 12 days. It was and continues to be a difficult time for our students. However, our district knew we needed to get our students back to school as quickly as possible to be able to have our families feel a sense of normalcy. Teachers went back to school on Friday, September 22 and began planning for the return of students on Monday. Every year Governor Rick Scott proclaims a day in September to be Dad’s Take Your Child to School Day. As a school, we decided to hold our Dad’s (or significant adult) Day on September 27th. My administration came to me and asked if I would run the Flipgrid station. I gladly accepted. We debated our topic: Should we talk about the hurricane? Should we tell parents to send a video thanking someone for their help during the aftermath of the hurricane? After much deliberation, we decided no hurricane topics! Our Topic would be simple: Parents, tell us what makes your child special! Students, tell us what makes your adult special! We were not sure if parents would come. After all, many were still dealing with the aftermath of Hurricane Irma. We sent home notices on Monday stating that the event was scheduled for Wednesday. We set up our PODS, our STEAM activities, put staff on place, and opened the gates! As a school, we expected a low turnout, but the response was amazing! Over 300 families attended the event! Parents were so excited to be there with their children. Our Pods were full and parents were waiting in line to try Flipgrid. I could not keep up with the amount of families waiting to try our Flipgrid Pods. I asked for extra iPads, but parents said they wanted to wait for a Pod to open up. They created 73 videos in 30 minutes! Flipgrid Fever was overwhelming that morning. Our event was a success and we were elated that parents had come. I tweeted out the event as usual and was not expecting the response I received. Tweetchers everywhere were asking where I got the Pods from and how they needed to try this at their school. We even received a phone call from a superintendent in Montana asking about ways to use Flipgrid to connect his schools. It was amazing and we were happy to tell them all about the pods, the event and new ways to use Flipgrid beyond the classroom.